I've chosen these because my personal and professional lives converge in them. 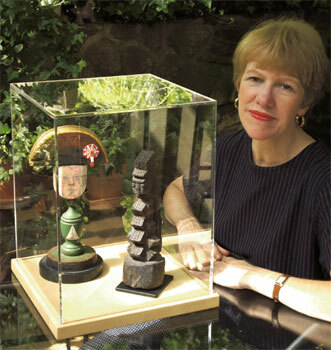 I gave the ikenga as gift to Fritz because we both were fascinated by African art and particularly African art that was directly related to the twentieth-century European tradition that is so familiar to us. When I saw this piece I was reminded of my first visit to the Musée de l'Homme in Paris which at that time still had works displayed in these dreary little tableaux that must have looked very much like the displays that the Cubists saw in the first decade of the 20th century. At that time Brancusi's studio was set up in a museum not too far away. The similarities between the angular shape of the ikenga and Brancusi's towers were apparent even to the naive 19 year old I then was. After doing research on this work, I discovered that it is the symbol of a strong arm; it's a macho power piece that would have been synonymous with brute strength and male ego. Fritz is strong in all the ways that this work does not represent. I love the irony of that. Both of us value this as an object that stands for our culture's debt to another culture. One of the reasons I fell in love with Fritz is that both of us have a passion for reading, although his tastes are more sophisticated than mine and include James Joyce's entire oeuvre. He's the only person I know who laughs out loud reading Finnegans Wake. The description of Lipoleum, which begins: This is the triplwon hat of Lapolium. Tip. Lipoleumhat, is one of his favorite passages and he appropriated it as a self portrait. It's my favorite of the many self portraits he's given me over the years.